50 years ago, Martin Luther King Jr. organized Chicagoans to respond to what he called “the fierce urgency of now”. 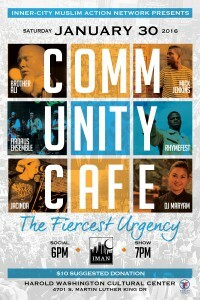 Join IMAN at the Harold Washington Cultural Center for CommUNITY Café: The Fiercest Urgency, an artistic journey through the fierce spiritual and social urgencies of our day, with dynamic performances from Brother Ali, Mick Jenkins, Rhymefest and more! This entry was posted in Arts & Culture, One Chicago by IMAN Staff. Bookmark the permalink.